When you add a modern page to a site, you add and customize web parts, which are the building blocks of your page. This article describes the Highlighted content web part. Use this web part to dynamically display content from a document library, a site, a site collection, or all sites. By default, this web part shows your most recent documents. If you don't have any documents or pages on your site, you'll first have to create or upload them. Add the Highlighted content web part: Start with adding the web part to your page. Choose content: Choose the source location (such as a site or document library) and type of content to show (such as documents or pages). 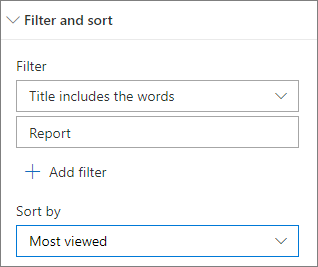 Filter and sort: Set filters to narrow down the content to show (such as documents modified by the current user) and a sort order. Select a layout: Choose between Cards, List, Carousel, or Filmstrip layouts. Hover your mouse above or below an existing web part or under the title region, click , and then select the Highlighted content web part. Once the web part is on the page, you can change the title by typing over the default title Most recent documents. 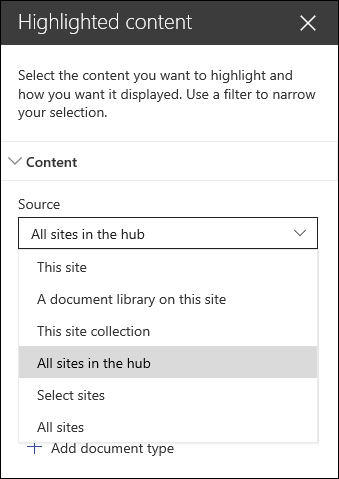 On SharePoint Online, in the Source dropdown, select where you want to show content from: This site, A document library on this site, This site collection, The page library on this site, Select sites. or All sites. 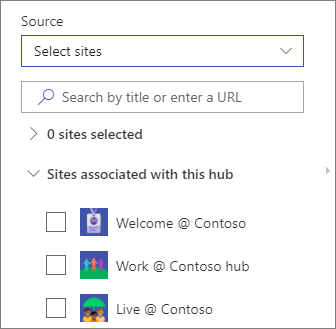 If your site is connected to a hub site, you will also have an option to select All sites in the hub. When you click Select sites, you can search for the site you want to add, or select one or more sites from Frequent sites, or Recent sites. 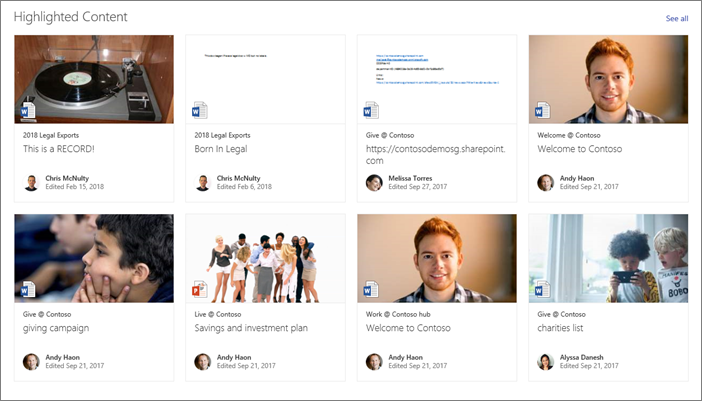 For SharePoint Server 2019, your choices are This site, A document library on this site, This site collection, and All sites. Note: If you plan on using multiple filters, see how they work together in the Using multiple filters section below. In the Type dropdown, select the type of content you want to show. The type of content available will depend on your source. If you want to show additional content types, click + Add content type. Once you have selected your content source and type, you can set filter and sort options to narrow down and organize the content. In the Filter dropdown, select what you want to filter by, and then enter the specific details for the filter. The filters available will depend on the content type. Recently added Enter the time period since an item was added (such as Today, Yesterday, Earlier this week, and so on). Recently changed Enter the time period since an item was changed (such as Today, Yesterday, Earlier this week, and so on). Created by Enter a user name if you choose Selected user. Otherwise, use Current user, which will filter for items created by whoever is viewing the page at the time. Modified by Enter a user name if you choose Selected user. Otherwise, use Current user, which will filter for items created by whoever is viewing the page at the time. Managed property This option is available for all Source options except Document library. Managed properties can be built-in or custom, but must be searchable. Enter a word to narrow down the list of searchable properties, select a property from the dropdown, and enter your criteria. For general information on managed properties, see Manage the search schema in SharePoint Online. For a list of available properties, see Overview of crawled and managed properties. In the Sort by dropdown, choose your option. The default is Most recent. 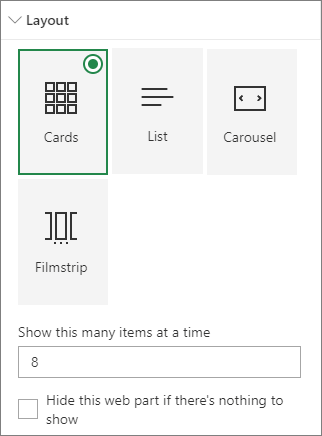 Choose Cards, List, Filmstrip, or in SharePoint Online, Carousel,, then enter the number of items you'd like to show and whether to show the web part when no items are found. 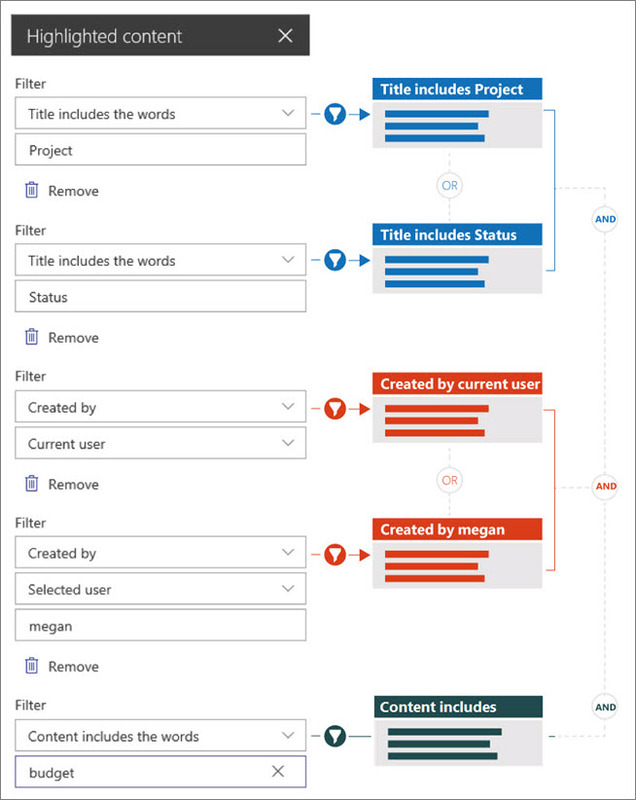 Note: If you’re familiar with earlier versions of SharePoint, Highlighted content is the newer, simplified version of the Content Search web part.